This honey garlic ginger chicken is sticky, sweet and cooked in the slow cooker in just 2 hours. It’s probably weird that I pulled out the slow cooker in the middle of May and I’m sure this recipe would have much more appeal in the winter months, but sometimes a craving just has to be addressed. You know that nasty honey bourbon chicken with the suspect brown sauce that the Chinese places in the mall hand out on sample platters as you walk by? Which, btw, I really hope you don’t eat. Ew. I can’t even remember the last time I ate at a mall Chinese place or any mall restaurant for that matter. The roach sighting on the Sbarro countertop a few years ago kind of turned me off. But for some reason, that honey bourbon chicken sounded reallllly good. Especially with a sauce that I could make and not worry about what sort of rodent might have been crawling in it behind the cash register. I know the slow cooker is supposed to be a convenience but honestly, I find it hard to plan far enough in advance to be able to spend 6-8 hours cooking something. I’m sure, however, if I didn’t have the luxury of working from home that would change out of necessity. The great thing about this recipe is that it takes 2 hours. If you don’t have hungry kids waiting to be fed at 5:30pm exactly, you could totally pull this off after work. We don’t eat until 7:30pm on a good day so while this cooked, I got my workout done and showered. Ps- these phase 2 livefit workouts are getting to be a littttle long for the liking. The result was a sticky, sweet, spicy sauce that coated every piece of chicken. Served with some fresh pineapple it was like a cross between the mall bourbon chicken and the takeout sweet and sour chicken. So comfortingly delicious and no msg. Win, win. Season chicken with salt & pepper. Combine honey, garlic, ginger, soy sauce, maple syrup, ketchup & sriracha in a small bowl and whisk together. Place chicken in the slow cooker and pour sauce over top. Remove chicken and place in a side dish. Pour sauce into a small sauce pan and reduce over medium-low heat until thick and syrupy. Add pineapple, sesame & green onion for garnish. This looks so delicious. And a roach at Sbarro’s? Ewwwwww. jealous of napa. just letting you know. Nothing wrong with pulling out the slow cooker in May. Makes life more convenient. Your dish sounds wonderful! 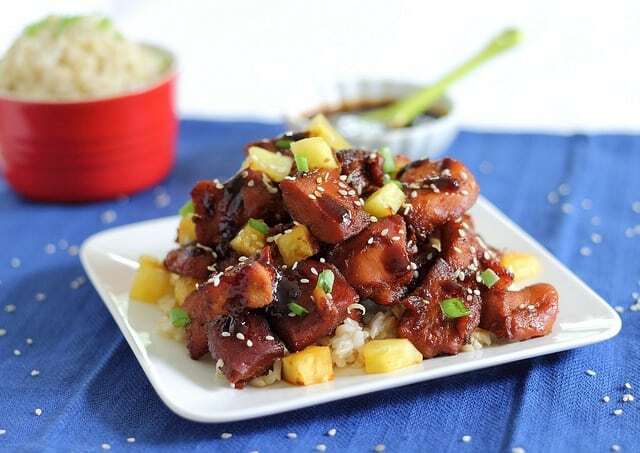 I love a nice, sticky sweet chicken dish! Roaches at the mall? Ew. Definitely pass on that. I’m probably weird in that I love using the slow cooker… even when I’m home! Yes, it was beyond disgusting and the best part was the cashier just tried to wipe it off with a dirty rag like it didn’t happen. The last time we ate chinese at the mall was the Galleria with that super confusing menu that kind of didn’t make any sense…”next…next …next” They always rush you even though there is no one behind you. We sat down ate our lunch and we both probably were wondering the same thing…why did we eat this crap. Oh that second photo…I just want to eat it right off the screen! I’m loving this dish! Yum! Totally going on the menu for this week. I don’t care if it’s in the middle of a heat wave in August, that crockpot is stickin’ with me! I am with you on the long Phase II workouts. I am in week 6, and have to get up at least at 6AM to get to the gym, do the workout, and be at work (to which I have to drive 35 miles on the Bay Area highway 101) at some reasonable time. Good thing my work schedule is flexible, so I can come in later and stay later. But it looks like the later it is in the program, the longer the workouts are, so I am not sure what I am going to do. Getting up at 5:30AM doesn’t seem attractive at all. Enjoy the beautiful Wine Country. The weather is gorgeous. Which it usually is the case here in Nor Cal. 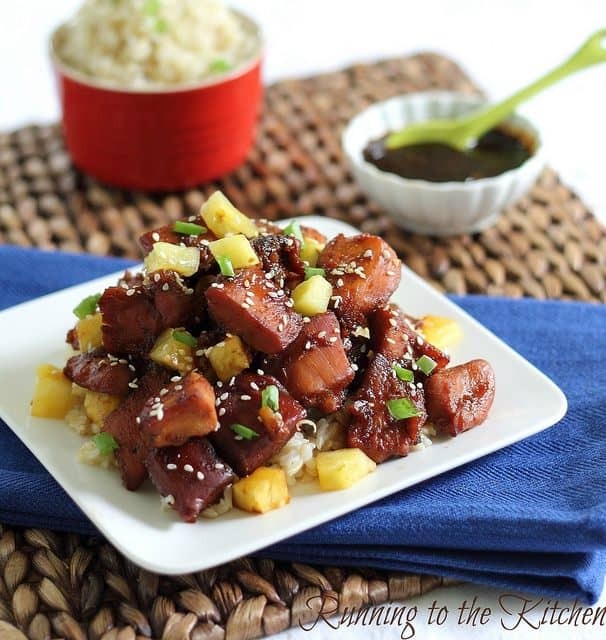 Oh man, a basic sauce of honey+soysauce+garlic+ginger together makes for a wonderful dish! 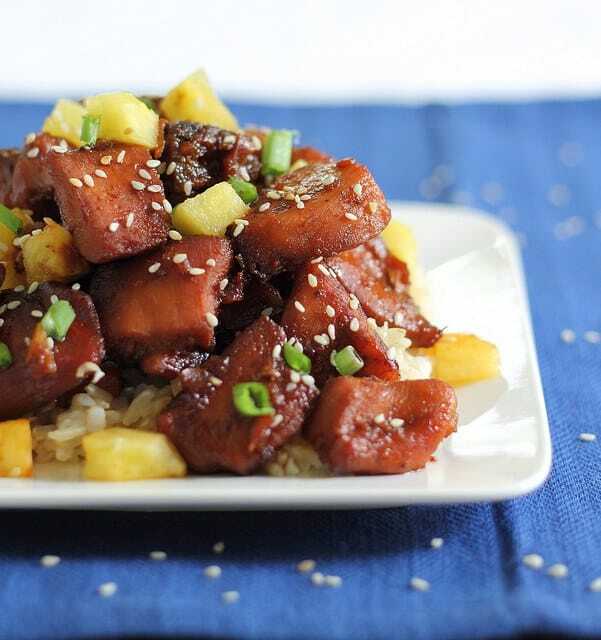 But, the addition of pineapple and Sriracha too… just delicious! All the ingredients in this dish are right up my alley! I have to plan for crock pot meals too because I want to cook with it when I’m around (totally against the purpose of the crock pot). For some reason, I am afraid it will blow up when I’m not at home and come home to a house blown up into smoke. This looks great and I will be making it for sure! Thanks! Ugh, mall food. This is a seriously better alternative! I love using my slow cooker in the summer. Usually, we’ll set it up outside on the back patio table…it gets ridiculously hot in the summer (I live in Phoenix) and anything I can do to keep the house cooler when it comes to cooking is necessary! I think I tried the bourbon once. Never. again. Nasty. I use my croak pot year ’round and I live in Florida, so I don’t think it’s abnormal. Crock pot, not croak pot. I need a nap. This looks so good! I love the honey, garlic and ginger flavors – mmm! And especially without msg, haha. I know what you mean about using a crockpot when you’re home most of the day anyways. I’d use mine a ton more if I wasn’t at home. I know some people do even though they are at home but it drives me kind of crazy waiting for something that I could cook faster, if that makes any sense. YUM – I have this in my crock pot right now and it smells so yummy, can’t wait to enjoy it (I love good crock pot meals for the summer that are still fresh tasting but don’t heat up the whole house). Could you suggest a way to make this without a slow cooker? I’ve got such a hot kitchen in the summer (and it’s correspondingly real cold right now) that I love slow cooker recipes to keep the temps down. This is amazing!! First recipe in our new slow cooker. Success! Could you put it in the slow cooker on low and cook for longer? Any recommendations on time? Wanted to try this as a make in the morning recipe to be ready when I get home from work? Yes, you probably could. I haven’t tried and you might want to add a touch more liquid to make sure it doesn’t get dry, but I’m betting it would work. I am new to the whole slow cooker thing, what kind of liquid would I add just water? Or more sauce? Maybe just add about 1/2 cup of chicken broth to the sauce when you make it. I wouldn’t cook it for much longer than 4 hours on low if possible.